We now have trained over 500 Certified Anger Management Trainers through the Anger Management Institute. Trainers are located in over 30 states in the USA, in Canada and Britain. Some of these Certified Trainers are designated as Anger Management Institute Affiliates and some have been designated Anger Management Specialists by the National Anger Management Association. The Anger Management Institute curriculum and programs have been approved by Dallas County Community Supervision & Corrections Department (CSCD) and various Chicago-land and other Illinois state court jurisdictions. The Institute’s Trainers programs are now endorsed and approved by the National Anger Management Association (NAMA). Once participants successfully complete our live workshops or home-study courses they are eligible for the following designation by NAMA: Certified Anger Management Specialist-Ior II. The current Anger Management Institute staff approved to present and certify Trainers & Specialists are: Lynette J. Hoy, NCC, LCPC, CAMS-IV and Steve Yeschek, LCSW, CAMS-IV. 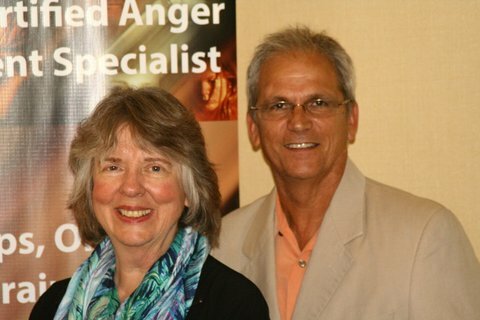 Lynette & Steve are Anger Management Consultants, Supervisors and Diplomates with NAMA. Dr. Jim Bedell states that the outcome studies completed so far on participants in the Anger Management Institute groups show that the What’s Good About Anger program is ‘evidence-based’. Participants evaluations and comments: “wonderful”; “exceeded my expectations”, “phenomenal”; entire conference amazing!” Now includes: current brain research; in-depth, evidence-based treatment planning for anger control problems! Contact Lynette at 630.368.1880, ext. 1 for more information on training programs. Read more about how to become an Anger Management Specialist with NAMA. Lynette J. Hoy, NCC, LCPC, BCPCC, CAMS-V, National Certified Counselor, Licensed Clinical Professional Counselor, Board Certified Professional Christian Counselor, President of the Anger Management Institute and CounselCare Connection, P.C. National Anger Management Association Ceritied Anger Management Specialist-IV, Diplomate, Supervisor & Consultant. Steve Yeschek, LCSW, CAMS-IV, Licensed Clinical Social Worker, Vice-President of the Anger Management Institute and CounselCare Connection, P.C. Steve is a Diplomate, Supervisor, Consultant & Anger Management Specialist-IV with the National Anger Management Association Steve is an excellent and experienced counselor and social worker, having directed Rapha Treatments Center in Chicagoland for over 9 years. Steve now is an ordained E.V. Free Pastor serving at Evangelical Free Church of Crystal Lake. He co-presents the Anger Management Trainer certification conferences with Lynette, provides anger coaching and counseling for various other issues. Providing anger management groups, seminars and coaching. Beyond the Storm is a certified, faith based, 12 week course on Anger Management utilizing the What’s Good About Anger curriculum. Held every Tuesday from 6:30 to 8:30 p.m. at Calvary Chapel Downey. Call: (562) 803-5631. Provides Addictions, Anger Management, Christian Counseling services. Offering anger management training/counseling for adolescents, teenagers, adults, couples and families. We provide training for schools, businesses and organizations desiring anger management consultation for their employees. Our organization also provides services for clients who are mandated by the court to complete 12 or more hours of anger management training. Chaplain offering anger management programs, treatments, and consulting to individuals, couples, and corporations.